You know those nights when you want a hearty meal but stuck for time. Last night was one of them. We had spent the entire weekend out and about and I had very few ingredients in my pantry and fridge so I whipped up a little Mexican magic! Tomorrow is our weekly shop, I promise. Feel free to use up whatever vegetables you have in your fridge, this is just a quick idea I came up with the ingredients I had. Be as creative as you want or keep it simply (that's my style) and most importantly have fun and cook with love. Poach chicken in water with paprika, cumin, garlic and S&P. I find this way it's a lot more tender and cooks faster for me. While this is simmering away, sauté olive oil with spices and vegetables. 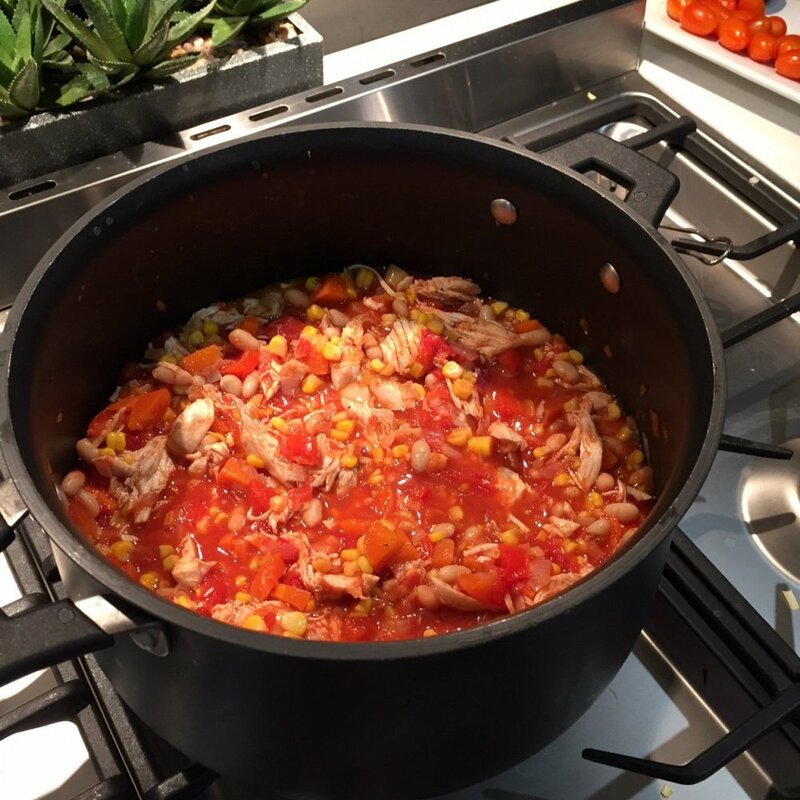 Once vegetables have softened add crushed tomatoes, add shredded chicken and simmer until thick and bubbly! We served ours with brown rice, smashed avocado, tomato, coriander, lime juice and yogurt. It was sublime. Don't get me wrong, this doesn't taste like the real deal in the oven that bubbles away for hours (when you have the time) but boy it came close! Life can get real busy sometimes but if you can make it work in a quick way to still provide the healthy benefits, then I am all for that. We had an awesome weekend from hanging out with the kids, riding our bikes, going to the beach exploring, footy games and planking for our YOU-app with Jamie Oliver "keep it up" action, to cracking some fresh macadamia nuts! How about you? What did you get up to over the weekend?